Using a potato peeler, pare the zest from the lemons in long strips. Place these in a heatproof jug or bowl with the grated ginger. Pour over the boiling water and leave to infuse and cool for 10 minutes. Strain the lemon and ginger mixture into a large jug and add the squeezed lemon juice and sparkling water. Add powdered sweetener, to taste. 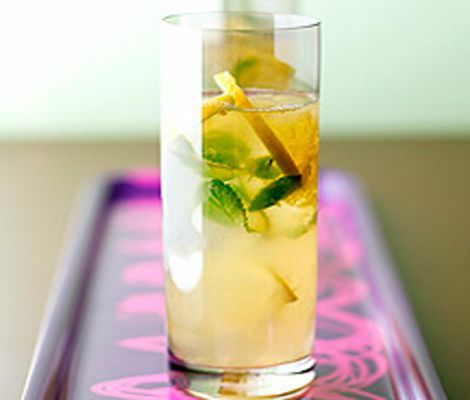 Share between 4 or 6 glasses, topping up with ice cubes and adding a few mint sprigs and lemon slices, to garnish. Chill the glasses in the refrigerator on really hot days to keep the drinks as cool as possible.